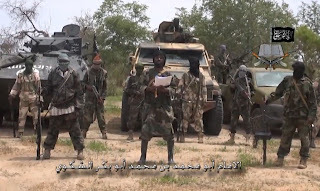 About 72 hours to the deadline given the Nigerian military to defeat Boko Haram, the terrorists have carried out devastating attacks in two northeastern states of Adamawa and Borno. No fewer than 50 people have died in two separate attacks in Maiduguri, the Borno State capital, and Madagali village in Adamawa State, North East Nigeria. One of the blasts in the Maiduguri attacks occurred near a mosque in the Suleimanti area behind the Central Bank of Nigeria while the other targeted a residence behind an internally displaced people’s camp known as Bakassi, which killed 18 members of a family. Based on initial reports, 28 people had died in the blasts while hospital sources said at least 75 people were receiving treatment from wounds sustained from the explosions. The death toll has since risen. The injured are mostly worshippers from the Suleimanti mosque who were attacked shortly after the early morning prayers. In the Adamawa attack, two female suicide bombers reportedly detonated a bomb in a market in Madagali, at about 8:00am on Monday and killed 17 civilians while 44 persons sustained various degrees of injuries. According to Brigade Commander, 28 Task Force Brigade, Brigadier General Victor Ezugu, those injured were evacuated to the 143 Rangers Battalion military facility in Madagali and the general hospital in Mubi. Meanwhile, the Nigerian Army has said that 14 suspected female suicide bombers aged between 12 and 18 attempted invading Maiduguri city from four entry points on Sunday. According to the General Officer Commanding the 7th Division of the Nigerian Army, Maiduguri, Major General Lamidi Adeosun, 13 of the suspects were killed while one was arrested.